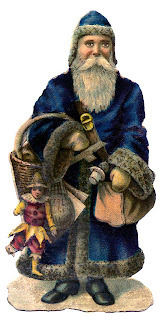 I hope you all had a wonderful Christmas and that Santa remembered to stop by your house. Mr. Painted Quilt and "the boys" and I spent a very quiet Christmas this year. We were supposed to go away to spend the holidays with friends close to where we used to live but had to cancel our trip at the last minute because of the weather. It's a good thing we did because large amounts of the white stuff not only fell on the day we were scheduled to depart but also on the day we were to leave for home. Our travel plans are now postponed until the Spring. Speaking of snowstorms, as I write this, we are experiencing a nor'easter with high winds and lots of snow. I tried to take a picture of what is happening outside but because of the drifting snow, I couldn't open the back door. This is what it looks like through the window in our mud room. There's no way I'm going to venture outside until it stops. The storm started last night around midnight and when it's all over sometime later this evening, 15" to 20" of snow will have fallen. It's going to take a while to dig out from this one. "The weather outside is frightful..the fire is so delightful. I managed to finish making four needlecases. and a couple of pockets inside to hold those needfuls that we can't do without. They wouldn't be complete without a wool needle keep, would they? To fasten them closed, just tie the two black ribbons into a bow and they're good to go. When open, they measure approximately 8" x 7". Each one comes with a label certifying that they are an original design and are made by me. I will be selling them on a first-come, first-served basis for $30 each which includes postage and handling to anywhere in the world. To avoid any confusion or misrepresentation, the contents as shown in the above photo are NOT included. If you're interested in purchasing one, just email me directly and I will send you a Paypal invoice. All four needlecases have been sold and are en route to their new homes. Thank you. And just in case you're wondering, it's still snowing and blowing. Yikes! With the season for love and sharing upon us and the end of the year in sight, I wish you and everyone you love peace, health and happiness. May God bless those who are not as fortunate as we are. My greatest wish is that people from all religions and walks of life be able to put their differences aside and come together to live in peace and harmony. You've all been my rock over the past year and I am forever grateful. We'll have a white Christmas after all! I don't know how much snow we're supposed to get but they were saying that places about 40 miles up the Valley from us could get as much as 8-10". This is heavy packing snow, the perfect kind for building snowmen but I doubt that it will last long because the ground hasn't frozen yet. But it does look nice, doesn't it? So what's a gal to do on a day like today when she's stuck indoors? Why bake some shortbread cookies, of course! I've already baked one batch but they only lasted two days. They happen to be Mr. Painted Quilt's favorites. Okay, I admit it...mine too! If you'd like to make some yourself, I promise that this is the easiest, virtually fail-proof recipe for shortbread cookies you'll ever make...and the tastiest, melt-in-your-mouth ones too! Place all ingredients in a bowl and whip for about 10-12 minutes. Roll dough into a little ball then slightly flatten and place on an ungreased cookie sheet that has been lined with parchment paper. I placed red and green glazed cherries in the center of mine but you can decorate them however you please. Bake at 350F for about 10 minutes. Do not overbake. Allow to cool completely then transfer to your favorite cookie tin. Makes about 50 cookies! Hint: You'd better hide them because they won't last long, especially if you have a similar two-legged mouse roaming around your kitchen! It smells divine in my kitchen! I would like to thank you all for your kind and heartfelt comments regarding my health update. Words can't express how much they mean to me. I'll be sending you both an email to let you know and to also get your snail mail addresses. I hope you enjoy your pincushions! Thank you all for playing along. I wish I had one to give to everyone. I'll leave you with this photo of Frankie and Ollie who not only enjoy each other's company but also their time together in front of the fire. Only ten more days until Christmas! Can you believe it's December 7th already and the First Friday of the month? Before we know it, the 25th will have come and gone for another year. It's been three months since my last First Friday Freebie and much has been accomplished in my sewing studio during that time. I've managed to finish two Christmas quilts which I'm thrilled about...not to mention a few other projects as well. 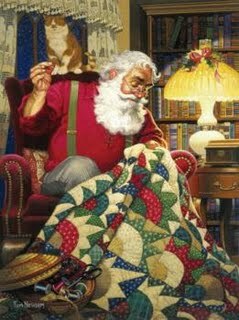 While making the Christmas quilts, the inspiration for this month's FFF came about. You all know I love samplers, stitching, wool-on-cotton applique and piecing...and the more vintage looking and scrappier the better! Do you remember this photo from two posts ago where I showed you our sitting room decorated for Christmas? Did you happen to notice the quilt hanging on the wall going up the stairs? That is this month's FFF and it's called, "Twas the Night Before Christmas"! Here are a few close ups because the lighting was not the greatest when I took the photo. My friend Alice custom quilted this one for me as well. Didn't she do another amazing job? I think this little guy might just be my favorite FFF to date. Thanks again, Alice for doing such an amazing job with very little notice and in a very short turn around time. To download the PDF file with the instructions, line drawings and photo, please click HERE. I'll leave you with this photo of Ollie and Frankie chilling by the fire early this morning. Aren't they just too much? I hope that you enjoy making Twas the Night Before Christmas as much as I did. Enjoy!